Unless you’ve been hiding under a stone for the past few years, you’ll know that motorcycle and scooter theft is on the rise. In fact, we’d go as far as to say, motorcycle and scooter crime in the UK is now an epidemic, especially in and around London. It’s easy to blame the police, who very rarely pursue motorcycle thieves; both those turning up on scooters to steal motorcycles and scooters and those using scooters for what is known as ‘moped enabled theft’, i.e. snatching mobile phones. The previously flimsy pursuit policy of the police – introduced after suspected drug dealer Henry Hicks died after crashing his scooter while being pursued – attracts would-be criminals to flock to moped-enabled theft as it gives them a ‘Get Out Of Jail Free’ card, due to the fact they know the police aren’t likely to pursue them. Why try and steal a phone from someone on the Tube or break into someone’s house, when you can do it all from a scooter, remain anonymous thanks to your balaclava, and know the police won’t pursue you? However you could put the blame squarely on us bikers and scooter riders who leave our thousands-of-pounds of attractive assets on the street with nothing but a steering lock to deter the scumbag criminals. 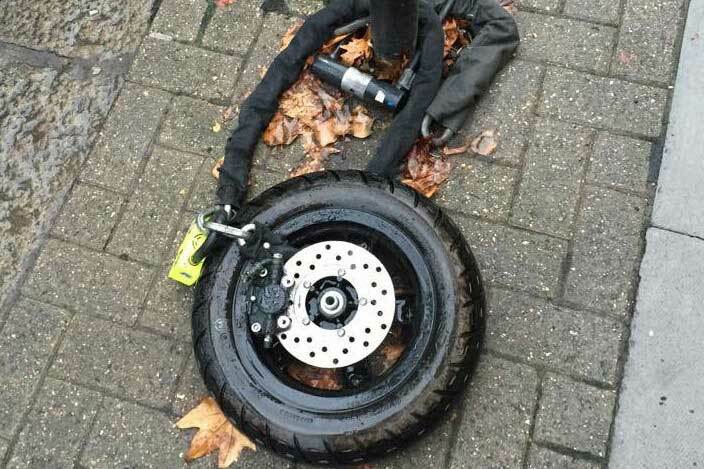 A recently survey by the Motorcycle Crime Reduction Group of 193 scooters parked in London showed that 50.3% were not locked in any way other than the steering lock and of those with a chain, only 15% of these were chained to something solid. A steering lock takes just seconds to break, et voila, you’ve just gifted a thieving parasite your £3,000 scooter, which they’ll break for parts or sell for £300 that day to someone else who’ll do the breaking themselves. If they want it, they’ll get it. Nonsense. We hear the same line time and time again: “If they want it, they’ll get it” but this simply is not the case. Even a cheap deterrent like a disc-lock can mean the thieves move on to the next softer target. Don’t be complacent. The majority of the tips below apply to commuter or those who live in cities or park their bikes out on the street overnight. The REALLY ANNOYING thing is that we tend to think these scummy motorbike thieves as calculating criminals. They’re not. Most of them are as thick as two short planks. Find a motorcycle or scooter with no security on it. Return later on your ‘ped with a pillion. Pillion hops off and pushes your prize possession out of its space and jumps on. You ride behind your mate with your foot on the stolen bike and push it away. We’re gifting these scummy low-lives by not doing the minimum required to defeat them. So, in no particular order, let’s look at motorcycle and scooter crime and work out whether or not you’re going to be a victim. If you fail one or more of these, you might want to make a bit more effort. You’re using a disc lock and that’s great news. However, thieves are defeating this security measure by cutting the actual brake disc, rather than attacking the lock. You have two choices: either fit your disc lock as close to the centre of the disc as possible, meaning a thief has more cutting to do. Or – and this only works for chain driven motorcycles – fit the disc lock on the rear sprocket, looping it around the chain. This will mean a thief has a hell of a lot more work to do, to get through the motorcycle drive chain and the sprocket, to relieve it of the disc lock. This won’t work with a majority of pin-type disc locks, but ones like the Oxford OF39 Boss will do the job nicely. If you only use a steering lock, frankly, you’re an idiot. A steering lock can be broken in seconds, meaning the bike is then able to be pushed away. Thieves will either push the bike around the corner or jump on the bike, while their mate on another scooter (probably also stolen) will put their foot on the rear of your bike and push it from the scene. Even a £20 disc lock, like this one from Xena will act as a good deterrent, meaning an opportunist thief has to smash it with a hammer, cut your disc lock or cut your brake disc to get going. All the above take time and thieves don’t like to hang around. Disc locks also come with built-in alarms. Again, the noise acts as a good deterrent. This one from Xena is worth a look. Sure, we know thefts are opportune – the thieves roll up, get the tools out and get busy. However it’s not always like this. Motorcycle thieves tend to have a ‘patch’ and they work this patch daily, getting to know the best areas for them to pinch from, whether that be a lack of CCTV, a quiet area, good escape routes or good bikes to choose from. If you park in exactly the same place every day, you’re making it easy for the scumbags to know your routine and plan around it. Thieves might look like they act in broad daylight, because that’s when the really stupid ones are caught on camera. However most don’t want to take risks, they hate not being in control. You want to be in a position where, when they turn up to a parking spot to pinch your bike, it’s not there. If you park your bike on the street but you’re going away on holiday – make the effort to park it elsewhere. We’re creatures of habit but that habit could be increasing the chances of you becoming a victim of motorcycle theft. Thieves have all sorts of agendas and the security you use might put them off from the get-go. If a thief is stealing your bike so that it can be broken into parts and sold, they’re going to be wary of anything with security markings. Kits like Datatag and Alphadot cost around £30 and enable you to apply the tiny ‘dots’ to the various parts on your motorcycle or scooter. Your ID is registered to you and should these parts be found, they can be traced back. However, you don’t even need to spend £30. For under a tenner, you can buy a UV marking kit which comes with stickers to let everyone know your bike has been made less appealing to thieves. This UV marking kit will do the job nicely. Sure, some thieves won’t care what your bike is marked with but for others, it’s not worth it, as the people they sell the bikes to don’t want to be breaking bikes that are easy for the police to trace. Unfortunately, scooter riders are the most lax when it comes to security, so it’s no surprise that scooters top the most-stolen lists, time and time again. This is most likely down to the fact that a sub-125cc scooter requires just a CBT to ride and is often the choice of the oppressed commuter who’s given up on the car, got bored of waiting for delayed trains and sought solace in a scooter. They’re just not clued up on motorcycle and scooter crime. Often they’re part of our two-wheeled world purely for convenience and as soon as their steed is stolen, they go back to public transport, fuelling the motorcycle crime epidemic. The trouble is, they leave us to shoulder the burden, in terms of increased insurance premiums and more scummy scrotes on the streets, geared up to pinch two-wheelers. It’s no surprise some bike theft gangs ONLY target scooters – they just know they’re going to be successful. This one is really simple. If you park your bike outside, a cover is vital to stop thieves identifying and then targeting your bike. Yes, you can tell whether it’s a Vespa GTS300 (scooter) or a BMW R1200GS (adventure bike) under a cover but the thieves won’t know from a passing glance whether it’s a £500 winter hack or a £10,000 pride and joy. OK, so some thieves will stop and take a closer look. Others will work as a team; someone will walk a street and rip all the covers off all the motorbikes so see what they are or slash them with knives. However most thieves work pairs. They’re lazy too and don’t want to stray too far from where they live. So they’ll ride around all the local roads, the guy riding pillion scouting for the next victim. As they head down a road, the uncovered bright red Vespa is going to stand out more than the bright red Ducati that’s under a cover. A plain black cover is ideal, nice and discreet. This one has the best user rating on Amazon, has a buckle to keep it secure and only costs £15. 15 years ago, a clever duo, Ian Porter and Michael Sladden came up with a great idea, they called it Lock2Lock. The idea is really simple: you pass your chain through the chain of another bike, meaning it’s that bit harder for either bike to be stolen. Thieves can’t as easily lift the bikes up or wheel them away. Sure, it’ll only work in busy areas like London where bikes are prolific enough that you can park next to one with a chain. Locking your chain through someone else’s chain when there’s no other street furniture or ground anchors to pass your chain around is a good idea. While councils remain ridiculously slow when it comes to fitting ground anchors, the Lock2Lock idea is a real winner. You can spend a small fortune on motorcycle security and that might put you off buying any at all. But when it comes to motorcycle security, the saying ‘Buy cheap buy twice’ means that if you buy cheap motorcycle security, you’ll be buying your motorcycle twice. Don’t trust a cheap chain and padlock like this one – it can be smashed with a hammer. Likewise, this tiny disc lock can be smashed with a few blows of a hammer or ground-off in seconds. Brake lever locks like these are next to useless. You can cut through a brake lever in seconds with a junior hacksaw, slide the lock aside and be away. Motorbikes are constantly stolen from private car parks, such as NCP car parks. Why? Because the barriers, car park employee and ‘out of sight’ nature of a private car park lulls us into a false sense of security. Motorcycle thieves love private car parks. They only have to worry about the car park employee and can tamper with bikes until their heart’s content. The thieves turn up on a stolen scooter, so the CCTV isn’t an issue for them. They wear balaclavas and bike helmets, so they can’t be identified. One police officer told us, they’re often so well wrapped up, with long coats, full-length gloves and balaclavas that they can’t tell how old they are, what colour they are or whether they’re male or female. Check out this link for a classic example of a private car park that’s a theft hotspot. If you do use a private car park, make sure you also use good security. Although some high-ranking police officers talk about the fact they ‘can and will’ pursue moped criminals we all know that broadly speaking, not all police have the authority to. Only specially trained police (usuaally Roads Policing units) can pursue scooter thieves. That, in turn, means that petty thieves are attracted to our two-wheeled world, purely down to the fact that a moped allows them greater impunity. For £300 they can buy a stolen moped. It’s attractive for the little ball-bags because: any idiot can ride one and they know they’ll rarely get chased. If the pillion removes their helmet, the police may call off the pursuit. If house burglars knew that they wouldn’t be pursued if they undid their shoelaces during a pursuit, they’d be untying them the moment they saw flashing blue lights. It’s ridiculous but it’s the world we live in. A steering lock is never enough. Use some form of aftermarket security. Use a motorcycle cover where you can. Think about where you use your disc lock. Vary where you park. Use a marking system. Don’t assume a private car park is safe. Finally, support the police by doing your bit to make your motorcycle harder to steal.